Please note that the content of this book primarily consists of articles available from Wikipedia or other free sources online. 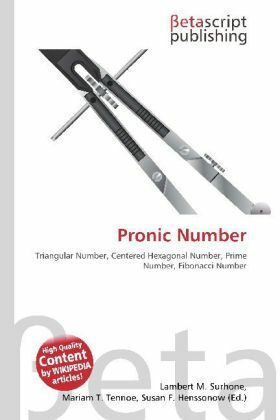 A pronic number, oblong number or heteromecic number, is a number which is the product of two consecutive integers, that is, n (n + 1). The n-th pronic number is twice the n-th triangular number and n more than the n-th square number. The first few pronic numbers (sequence A002378 in OEIS) are: 0, 2, 6, 12, 20, 30, 42, 56, 72, 90, 110, 132, 156, 182, 210, 240, 272, 306, 342, 380, 420, 462 Pronic numbers can also be expressed as n² + n. The n-th pronic number is the sum of the first n even integers, as well as the difference between (2n 1)² and the n-th centered hexagonal number.